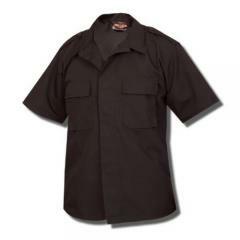 The Short Sleeve Tactical Shirt from Tru-Spec is a tough, professional garment that can be worn as part of a uniform. It is made from a high-performance polyester-cotton rip-stop blend that resists tearing and wear, and comes in a choice of five colors. The concealed five-button front placket makes the shirt easy to put on and take off, and its snag-free construction protects the buttons. The two chest pockets are bellowed, allowing them to expand to accommodate extra gear but keeping them sitting flat while empty for a professional appearance. Their button flaps provide extra security, and the left side pocket includes a pencil stand.